The intention of this Initiative is to create awareness worldwide of the peace building process within ourselves. 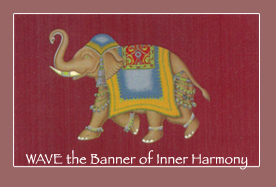 The primary commitment of the Initiative is to harmony. Each one of us must strive to make this commitment greater than any other commitment to particular goal in our life. Harmony is a living force within the heart and mind of each and every person and can be generated through Living Ahimsa-- peaceful everyday practices that reflect and recreate the universe's energies and rhythms. The investment necessary for manifesting health and harmony comes from the treasure trove that is within the human heart and its mining requires ardent commitment to cultivating inner harmony as a first priority. Unlike the making of war, violence, and disease, harmony recovered requires each human to dig deep into the very heart of being to find their forgotten memory of harmony intrinsic to the human spirit. To recover our memory of nonviolence and nonhurtfulness, we must first develop the paramount expression of love and respect for each other - not in spite of - but, because of our human differences and diverse beliefs. In this new millinea, I am happy for this opportunity to present a radical approach to nurturing and achieving World Peace. This Global Initiative of Living Ahimsa is about the change and transformation we can effect within ourselves in terms of embracing with love a person/persons for whom we may have formed an intense dislike; or showing respect for an idea or belief that we may find offensive. Doing the inner work to transform the Self is the most effective way to ahimsa- peace and harmony. This approach demands that we meet the challenges of self beliefs and ideas fostered by traditions from which each one of us humans have emerged and to which we have formed potent images of beliefs we hold to be true. Quite frequently, we hold these ideas to the demise of the beliefs of other beings and cultures. 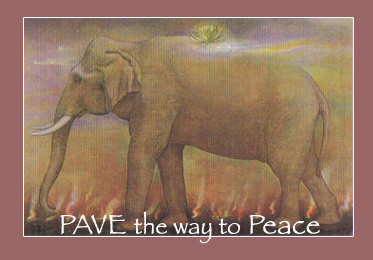 PAVE and WAVE Peace Initiative is not about anti-war marches and demonstrations, or collecting signatures to send to Congress, or any of the otherwise positive, nonviolent approaches we may endeavor to support Peace. It is about doing our inner work: through nonharmful thought, mindful speech, action, and prayer. First though, we must shift our thinking to accommodate the views and beliefs of others. We must also learn to fortify the Divine Energies within ourselves. The mission of PAVE and WAVE Peace Initiative is to broadcast the collective invisible expression of loving embrace and gentleness throughout the universal sound waves so that the breath force and boundless vibrational energy from which all life is formed can be invoked to influence the global movement of awareness, love, and abundance in every crevice of each mind and heart and in every corner of the Earth. Together, we do have the knowledge and power to manifest Peace on Earth. Why then is Peace the most illusive reality in our time? Have the numerous wars of the world brought Peace closer to our lives? What will it take to cultivate a sustainable peace? Since 1985, world military expenditures have totaled over $14 trillion. In the words of a Peace Pilgrim, we always seem ready to pay the price for war. Almost gladly we give our time and our treasure - our limbs and even our lives - for war. But we expect to get peace for nothing. Obviously, there is no price for peace because unlike war it is not a commodity. Ahimsa. Peace is a living life force within the heart and mind of each and every person and can be generated through awareness. The investment necessary for manifesting peace comes from the treasure trove that is within the human heart and its mining requires ardent commitment to cultivating inner harmony as human's first priority. Unlike the making of war, peace recovered requires each human to dig deep into their character, into the very heart of being to find their forgotten memory of love and compassion. To spread the word and help bring awareness to MOM's Inner Harmony practices for World Peace, kindly download WAVE and PAVE Peace Initiative Flyers and post in appropriate locations in your community.